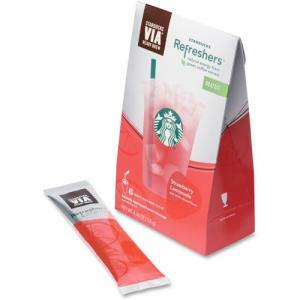 A breakthrough innovation to the energy category, VIA Refreshers make delicious, light and thirst-quenching beverages with a natural boost of energy, from green coffee extract, that you can feel good about. Simply tear open a packet and add 16 fluid ounces of cold water for a naturally sweetened, light, juicy treat. Strawberry Lemonade combines juicy strawberry and tart, sweet lemonade with hints of lavender and unroasted coffee beans for a delicious, strawberry lemonade-flavored energy boost.